Five summers ago, I found myself rendered momentarily speechless, mid-conversation, as a dear friend and I walked together for lunch. A few minutes later, flat on my back on the pavement, heart pounding, short of breath, mind racing. We have a difficult time with choice (or, at least, with choosing) because we have a difficult time with death. Choosing always involves the death of what is not chosen. The death of a possibility. The death of a particular future that will, now, not be. And because choosing requires us to face death, many of us would rather not choose at all. And then we can only live a life that is never quite our own, because in the absence of our own choice everything is effectively being chosen for us. There’s no less death here – we’ve simply turned our face away from it. But there is much less dignity, and much less responsibility. Stepping into our lives means, inevitably, that we step also into the death of things. Watching Julianne Moore’s sensitive and touching portrayal of a women with early-onset Alzheimer’s disease in Still Alice, I’m struck by how much each of us stand to lose. Whether it occurs for us as the loss of our selves first, as it does for Alice, or in some other configuration, we’ll one day lose all of our relationships, all of our possessions, all of our stories. We’ll lose trees and buses, boring train journeys, washing the dishes, music, kisses, worrying about money, sun-filled afternoons, drawing, gazing into the eyes of another, learning, the saltiness of the ocean, tax returns, earache, job titles, paperclips, mountains. It’s the knowing that Alice’s departure awaits all of us, though in wildly varying forms, that makes watching it so tender and so affecting. And it raises a question for all of us – what to do with this knowledge? Surrender and despair because nothing ever works out anyway? Open ever more widely to the wonder of the life that is here already? Make ourselves feel strong, impenetrable, holding rigidly onto our ideas and fighting away what scares us? Retreat into a world of banal distraction, turning into what’s trivial because it soothes us? Build towers and edifices – real or symbolic – so that our names are never forgotten? Damage and destroy others, using our destructive power to give us the feel of conquering death? Open ever more to the knowledge that we’re all – all of us – in this together and act from there? It seems to me that we’re always in the midst of choosing one of these responses, or others like them, whether we’re paying attention to our choices or not. And the kind of life we lead will flow, in significant part, from the way in which we choose to run from life and death, and from the way we choose to turn towards them. What a miracle our consciousness is. … that we make worlds. Maybe it’s only when we come into first-hand contact with death that we appreciate all at once what a miracle any of this is. And most of us do not come often into such contact directly. We are hardly in touch with the inevitability of our own end. Death is a rumour, a whisper, a great silence of which we are reminded only occasionally. It is, mostly, what happens to others. I am coming to see that when I forget death I also forget how improbable any of this is. I forget that my body lives and that I live because of it. In my forgetfulness I am quickly distanced from the realness of things. I try fit in, to be liked, to avoid judgement, to stay within familiar horizons. I hold back. I retreat into the security of my own mind, where my suppositions and judgements of people can not so easily be tested. I become concerned with looking good. I get distracted, reaching repeatedly and automatically for what feels recognisable, for what will soothe me. But in order to shield myself from death something has to die and freeze and become very small within me. I’m gradually finding out that the miracle of my own consciousness and the consciousness of others comes with a compelling responsibility to take care of life – to turn away from automatic pilot, and towards creativity, compassion, fierceness, love. Away from distraction and towards being present. Away from disconnection and towards listening deeply and speaking out. Away from denial and towards what’s true. Because in my forgetfulness I also forget – and oh so quickly I forget – just how soon this miracle will be over for me, and for you, and for everyone we know. If you really understood this, would you lead or manage others the way you do? Work the way you do? Live the way you do? And if not, how would you lead, work and live – in the full knowledge of endings – instead? I’m sitting on the beach at Mar de Jade on the Pacific coast of Mexico. The sun is setting, fire-red, turquoise, slate. The stones and sand, still warm. About twenty feet from where I’m sitting I can see the occasional silhouettes of fish leaping from the water. And further, westwards, a group of pelicans are circling, sharp against the twilight. Each, as if taking turns, chooses a moment to furl its wings and dive into the waves before climbing, fish-laden, to join the others. I sit for nearly an hour, as the sky darkens. The pelicans wheel to the south. The tall lights of distant boats come into view. This moment, with its tender joyful sadness, sings to me of sand and stars, of friends who are here with me, and of my family far away and back home on another side of the world. I remember the feeling of such places from my childhood – the easy feel of being swept up into an endless and timeless landscape, wondrous and vast. And today, in my forty-fifth year, the same wonder tugs at me. But from this part of life it’s different from before. I can already feel the inevitability of losing all of this, one day and who knows when, for another kind of timelessness. This week, to mark the first anniversary of this project, I am republishing favourite posts from each month of the first year of On Living and Working. This is from September 2013. Sometimes, in the midst of all our striving, longing, and reaching, our building of towers and the making of names for ourselves, it’s important to remember that one day we will, with certainty, lose it all. Some of this will happen piece by piece. We’ll gradually say goodbye to people as they leave life. We’ll realise, perhaps suddenly, that their presence in the world touched our hearts and lit up our eyes. We’ll find out that their worth is beyond words. And for all of us, the loss will also come entirely at once – maybe at a time when we least expect it, before we can even know it’s happening – when it is ‘I’ who is leaving and it is others who have to say goodbye. Some of us take a long time to find all this out, holding our inner gifts back from the world until we’re sure the time is just right – a time that may never come. But others seem to live with this understanding so fully in their hearts it’s as if nothing is withheld. They’ve discovered that the point of life is life itself, and that each of us is simply another expression of life’s beauty and wonder. And from this understanding flows their kindness, their generosity and their wisdom, so that they shine brighter than the sun. You will at some point, inevitably, get ill.
You, and all of us, will die – as do all our projects, our creations, and even, over time, all that which we thought would be our ‘legacy’. Nobody escapes this. No balm, no cream, no status, no wishful thinking, no protestation of the unfairness of all of this will make a bit of difference. It is simply the way of the world. You can run away from this realisation for only so long. And then you have to choose – will you turn towards life because of it, or away? What kind of life, leadership, relationship, work is produced from your turning away? And what kind of life, what kind of leadership – what sort of fierce, practical loving-kindness – might be produced from living in the full knowledge that these four are the case, inevitably, for every single one of us? My son asked me this evening how I would spend my time if I knew I had just one week to live. On a mountainside, I said, or by the sea. With my closest family, and with my dearest friends. No question. The conversation reminded me that very few of us ever discover in advance which is to be our last week. And we don’t get to find out which parts of life are actually the important parts, perhaps until they’re done. And how important it can be to live, in each of our day-to-day choices, in the full knowledge that all this is the case, for all of us. For a wonderful book on this topic see ‘A Year to Live‘ by Stephen Levine, a wise and courageous man who learned much about life through his dedication to supporting people in death. The book describes an experiment in conscious living – as if there are only 365 days left to go – and is beautiful, profound, and practical. In a famous story by Franz Kafka, a man who is searching for truth comes to a door, guarded by a powerful gatekeeper. The two talk for a while, and the man discovers that what he seeks is within. But when he realises that this is only the first in a series of doors guarded by successively fierce and powerful gatekeepers, he decides to sit for a while and work out how he can obtain permission to enter. The man sits, and he sits, occasionally striking up conversation with the gatekeeper, and the years pass. The man wonders what it will be like to eventually cross through the door, and why nobody else seems to have come by to gain entry. And as the man finally reaches the end of his life – still waiting – the gatekeeper reaches out for the door. This door, he tells the man, was only for you, and now it is time for me to close it, for ever. So much of our lives is exactly this way. Faced with a threshold to cross – as happens to each of us innumerable times – we easily hesitate. Waiting on the known side of the door feels so much better, and so much safer, for who knows what succession of trials and dangers awaits on the other side? There, we will have to face our anxiety and fear, and an uncertain world in which much that we’ve come to rely on can no longer save us. And while we know that our chances of living fully are much greater if we’re prepared to step in, we can see only how our lives would be safer staying just where we are, where the reassuring contours of the world as we know it can hold us. And eventually, each of the doors in our life closes, as we knew they always would, and we find out that the safety of staying small, and quiet, and not bothering anyone – the safety of holding the horizons of the world tight and enclosing – was never any genuine safety at all. My grandfather died nearly twenty years ago. For most of his adult life he owned and ran a very small, very modest clothing shop in suburban North London, like many second-generation Jewish immigrants of his time. And as he grew older, his clientele grew older with him. No flashy refits or rebrandings to reach a wider audience. Just years of dedicated service to the people he’d served for so long already. When he died, and we gathered around the graveside, I looked back to see a long line of mourners stretching back from the grave to the prayer hall. Many spoke of his care for them, of his commitment, and also of his friendship. I realised then that he was leaving behind him something that many of us never achieve, but which is worth more than status, high office, the construction of big buildings, and the making of millions (each of which, certainly, have their worth). He left behind him scores of lives touched, for the better, by the kindness and constancy of his presence in the world. And, I wonder, what would become possible if you worked on this alongside all the other important and ambitious projects you’ve dedicated yourself to already? In the end, nothing works out permanently. Even the biggest, most robust organisations pass and fade away over time. Life as we know it keeps on changing, despite our best efforts to stop that happening. And eventually, all of us die, leaving everything we’d accumulated and created behind us. Before long, all of that disappears too. So whatever you’re working on now, whatever glorious future plans and hopes you’re working towards, it would be worth checking that what you’re doing is also worth it for its own sake, regardless of how it turns out. Because in the end, that it mattered at the time might be all that’s left. You might like to deny it, but there’s no way of escaping that you’re a biological being. This means you’re subject to all of the realities of biological life. You were born, and one day you’ll die. You’ll get ill. You will age. You must eat, sleep, exercise and rest sufficiently. All this to maintain your capacity to move in the world, to allow your body to repair itself. And if you don’t, your strength and vitality will diminish more quickly than otherwise, atrophying over time. You’ll become prone to the diseases and ailments that your body was once able to defend itself against. And because you’re also a mammal you will need nurturing relationships and connection with others – the foundation stone of what distinguishes mammals from all other creatures. Because you’re human you need art, inspiration, music, beauty, meaning, community, and society. You are not a machine, nor a brain simply carried around from meeting to meeting by your body. If you treat yourself as such, as seems to be called on by so many organisations, you’ll eventually and inescapably suffer the consequences. And if you treat others as such, you’ll surely rob them of the greatest contribution they have to bring your organisation – the vibrancy and creativity of their life itself. Everything you’re involved in, everything you’re committed to, everything you know – all of it will come to an end. When you understand this, can you really continue in your detached, distracted way? Or keep holding back because of your fear? Or mute your voice and your contribution until you are sure that others will like it, and like you? Surely, when you know that everything will come to an end the only response is to throw yourself deeply into what you care for, with both fiery commitment and a fierce, unshakeable compassion towards yourself and everyone around you. What else could life and work possibly be for? People leave life without warning more often than we care to consider. Would it not be more fitting to fill with gratitude for their presence in your life? To be amazed that the tiny chance that you would coexist actually came to pass? To treat them with kindness? In the end, all of us die. We’ll lose all our relationships and all our possessions. As will everyone else we know. You could slip into a denial of life itself, as many people do. If it’s all going to end, and if you can’t have immortality for yourself, your ideas or your projects, you could lose yourself in a sea of triviality: toys, distractions, status symbols, diversions. You could numb yourself, turning away from life so you can avoid the anxiety of facing its finiteness. If you’ve never really lived, perhaps life’s end will exact less of a price. Our you could try frantically to build, to make a mark so you’ll be remembered. At least this way it looks like you’ll have a way of cheating death. Inflate your ego, shout the loudest, build the tallest, be the richest, out-fame the famous. Make a name for yourself, whether for good or for ill. But, apart from for the tiny handful of people whose fame is enduring, within a couple of generations your name, all your achievements, what we take to be your legacy will be gone: all faded into the vast, anonymous, shifting background of human life. The problem with both of these responses is that they put you at the centre of the world. They’re an attempt to force life to treat you on your terms alone, to give you what you want because you won’t take life as it is. Instead, and more meaningfully, you could turn into the fierce heat of life itself. Understand that the point of life is life, and that you cannot be separated from it. Discover all the ways in which you are an expression of a process that is immeasurably bigger than you are and is at the same time undeniably part of you. From here, the response to your own life’s finiteness is no longer cheating death but finding a way to contribute to life’s unfolding. This calls on us to connect deeply with others, to contribute generously without knowing what will come from it, to find the courage that comes from openness and vulnerability, to speak out, to lessen suffering, to cultivate dignity, to seek wisdom, to create, to teach, to innovate, to serve. And to do all this as an expression of whatever work we’ve taken up in the world: running a business, founding corporations, mastering a profession, raising a family, inventing technology, leading a team, educating people, designing a product, investing in markets, delivering the numbers. All of this is what makes possible living life not as a way of getting what you want, but as a contribution. And perhaps it’s also a way of living life as a work of art. “Everyone should have two pockets, each containing a piece of paper. On one should be written: I am but dust and ashes, and on the other: The world was created for me. One moment, grandiosity:- I can do anything. I’m unstoppable. The next, deflation:- I’ll be crushed by the world and the people around me. Some people are more familiar with one than the other. But many of us bounce between them, thrown each way by circumstance: a stray thought, a memory, the look on someone’s face, another’s disapproval or approval, the weather, hitting a target, missing a deadline, lost keys, making a sale, an email subject line, a child’s cry. Of course, neither of them are true, and the secret to living is knowing always how to remember this. You are neither super-hero nor flea. You never were. You’re a human being – vast, contradictory, mysterious, talented, bounded, boundless and of inexplicable value. 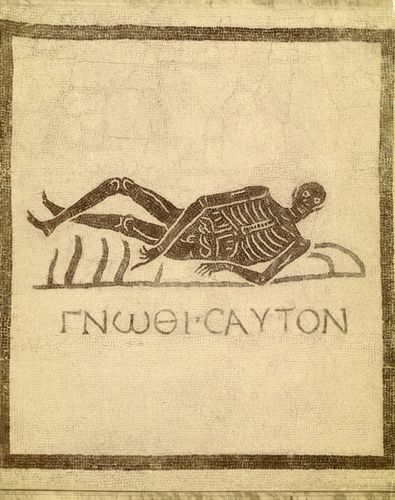 ‘Memento Mori’: a reminder of something so easily forgotten, that one day each of us will die. Staring into the inevitability of our end with courage and clarity can be like looking into the brightness of the sun – almost unbearable. But having the courage to look again and again can bring us fully, searingly, vibrantly to life. And it can teach us much about what’s actually important. That project that’s strayed from the plan, the hundreds of emails in your inbox, the irritation you feel at someone who didn’t do exactly what you expected; all look different in this light. Perhaps what seemed so unquestionably central wasn’t that significant, after all.